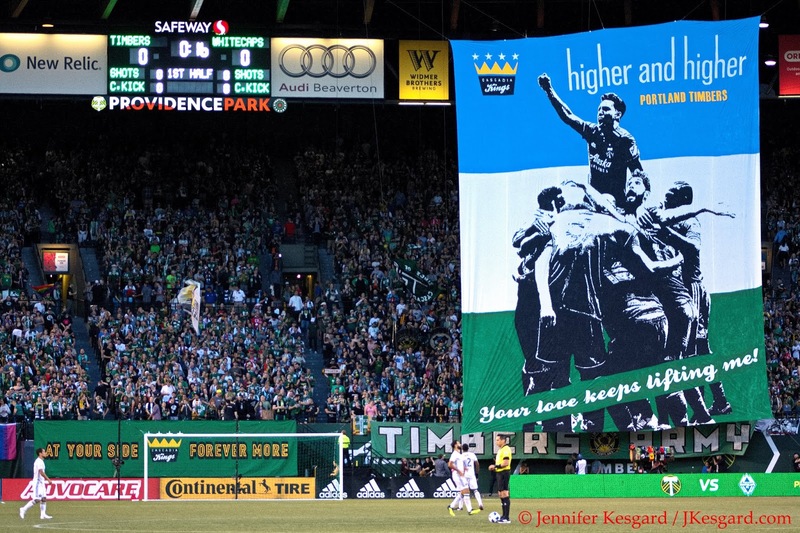 Another impressive display from the Timbers Army before the match. The law of averages in the most boring yet straight forward definition is that it's the principle that supposes most future events are likely to balance any past deviation from a presumed average. It's been simplified over the years to sayings like "You can't win them all" or "The more you try something, the better chances there are of success" or some other fancy buzzwords that fit on a placard, but Portland Timbers fans knew this day was coming at some point. The team hadn't lost in MLS play since April 8 in Orlando, ripping off a 10 win, 5 draw sequence since, and if you count the U.S. Open Cup, you can throw in 2 more victories and a defeat yet the record is still very impressive. 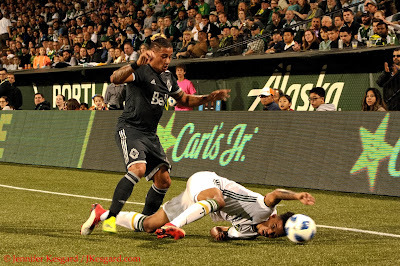 It hasn't been easy as the Timbers have weathered several challenges on the way, from differing tactics, absences, injuries, officiating, struggles in form, opponents, the conditions, and they have found a way to secure a results in every situation in the streak. 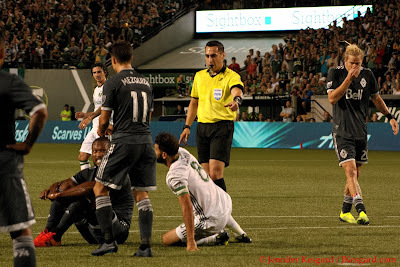 In their final match of a lengthy 4 match homestand, however, the Timbers finally ran across a combination that they couldn't overcome as the Vancouver Whitecaps ended the unbeaten run with an impressive 2 to 1 victory over the Timbers at Providence Park. The myriad of reasons for the defeat have been debated about on social media by Timbers fans - the officiating of Jair Marrufo and his crew, the lineup choices by Timbers Coach Gio Savarese, the tactics of the Caps during the match, a subpar performance from Diego Valeri, a litany of defensive mistakes from a defensive line that has been stellar in the previous months, and recent changes in the team's roster. But for me, the reason for the loss is fairly simple: the Whitecaps came in and dictated the pace and approach from the opening whistle, took advantage of 2 mistakes to get an early lead, then bunkered down to withstand the inevitable Timbers rally. The plan by Whitecaps Coach Carl Robinson worked to a charm, and it's now got a Timbers team that has been pushing all the right buttons to deal with adversity suddenly looking for answers in front of a compressed two weeks of matches. The Timbers travel to D.C. United on August 15, a side that has found some energy by the addition of forward Wayne Rooney, to then follow it up with a visit to Sporting Kansas City on August 18, a traditional tough place to get points. The Timbers then return to host Seattle on August 26 and Toronto on August 29 before going back east to play New England on September 1. Twenty one days, 5 matches, 2 coast to coast trips, 2 midweek matches bracketed by matches on the weekend - if there was a stretch that would be testing the depth of a team, it's this time period. Adding more to the equation is that the Timbers are still sorting out team dynamics with Fanendo Adi now gone to FC Cincinnati, Vytas in D.C., and the additions of Jorge Villafana and Lucas Melano not fully acclimated and available yet. Kendall Waston wasn't sure he fouled Valeri, but Jair Marrufo was certain. Savarese has quite a challenge in the coming weeks, but if there has been anyone that has been consistently good at making choices in the lineup, it's been Gio. However, many were questioning the starting eleven for Portland versus Vancouver as the team went away from the 3 defender, 5 midfielder/fullback, 2 forward formation that has produced wins over Houston and Philadelphia. Savarese employed a more traditional 4 defender, 4 midfielder, 2 forward starting group in front of goalkeeper Jeff Attinella although he did keep the defensive line of Alvas Powell, Larrys Mabiala, Julio Cascante and Zarek Valentin in tact. In the midfield, Savarese used Diego Chara and David Guzman as the attacking midfielders with Guzman and Chara as the top and bottom points on a diamond with Sebastian Blanco and Valeri as the attacking mids out wide. Up top, Savarese gave Dairon Asprilla the start at forward alongside Samuel Armenteros, but the Timbers lacked a true target forward available as a substitute with Foster Langsdorf and Jeremy Ebobisse both with Timbers 2 out in Kansas City playing against the Swope Park Rangers. Of the available reinforcements, Savarese had only 2 attack minded replacements available in Andy Polo and Andres Flores, as otherwise, all the other options were defensive minded (Kendall McIntosh for goal, Marco Farfan and Bill Tuiloma for defense, Cristhian Paredes and Lawrence Olum for defensive midfield). Robinson, to his credit, decided to play a more defensive strategy with the Whitecaps and play a 5 player midfield with Felipe being the central midfielder to control the tempo. With Stefan Marinovic tending to goal and Brett Levis, Aaron Maund, Sean Franklin and Kendall Waston manning the backline, the Whitecaps had Brek Shea, Nicolas Mesquida, Aly Ghazal and Cristian Techera aiding Felipe in holding the middle. Up top, Robinson employed Kei Kamara, a very experienced and feisty forward, but he had several options available to supplant him in Anthony Blondell or Erik Hurtado if needed. Essentially speaking, Robinson's tactics were trying to clog up the middle and frustrate the Timbers midfield in their play making, while hopefully creating counter opportunities to send Shea, Techera, Mezquida or Ghazal forward to help Kamara on the attack. The key matchup would be how Chara and Guzman would partner together to hold up the middle and keep the Timbers from getting bogged down, but Vancouver also chose to keep Waston and Maund near Armenteros anytime he crossed the center line and apply pressure. If the plan worked and Portland couldn't remain composed, it would work like a charm, but if the Timbers were able to break down the defense, it could make for a long night for the Canadians. Alvas Powell was very good vs. the Union, but against the Caps, he was meh. The first 10 minutes showcased both sides churning up and down the pitch, but failing to put forth any shots on frame to challenge the keepers. After Kamara and Powell traded misses, the Caps were staked to the early lead courtesy of a Kamara header; Asprilla had fouled Ghazal previously to stop a promising run, and Waston stepped in to take the free kick from mid pitch. Powell and Mabiala were near Kei at the restart, but Attinella had tried to cheat off the line to take up space, and when Mabiala lost track of Kamara, the Caps striker was able to send a looping header into goal for the early lead. Portland turned up some pressure with a string of free kicks and corners in the subsequent minutes, but nothing mounted from the effort despite the efforts of Armenteros and Asprilla. The Timbers thought they had turned the tide in the 40th minute when Waston took out Valeri with a slide tackle in the box and Marrufo pointed to the spot for a penalty, but after a delay and some theatrics from Kamara, Valeri pulled the restart wide left of goal and the score remained at 1 to 0. Further pressure was added just 2 minutes later when Shea and Kamara burned up the right flank on a counter, and Mabiala and Powell lost momentary track of Techera burning up the left side. Shea's cross found the smallest of the three players near the spot with the header, but it happened to be his teammate who put the shot on target, and Attinella could do nothing to stop the effort. Portland suddenly found themselves down by 2 goals, which hadn't happened at home in 2018 up to that point. Savarese decided to go with some tactical changes at the break, and sent out his team 2 minutes before the halftime break was due to expire, but it wasn't the change that many were anticipating as Armenteros gave way for Polo as Samuel was dealing with some tightness in his back and the team held him out as a precaution. The change nearly yielded an early goal in the 49th minute as Polo challenged Marinovic from distance, but the Caps keeper parried the ball to the right and Asprilla could do nothing more than chip the ball over the crossbar and out of play for a corner kick. Powell broke down the right in the 58th minute and challenged Marinovic from the right with a missile, but the Caps keeper again pushed the ball out for another corner kick to keep the clean sheet. Polo and Powell traded some near misses over the next several minutes, but Portland was finally able to get on the board with another penalty awarded in the 69th minute when Franklin extended his arm in defending Blanco, and he went down in the box under contact and Marrufo awarded the penalty. Despite some more theatrics from Kamara to delay the restart, Valeri did convert this effort going wide left to push the scoreline to 2 to 1. The tally gave the home side some hope for a recovery, but outside of a miss from Valeri and Powell in the closing minutes of regular time and over 7 minutes of stoppage due to several delays in play by the Caps, the score ended up at 2 to 1 with the Caps running over to celebrate in front of several hundred traveling fans from Canada. Between rushed or blocked shots and off passes, there was also lots of falling. The statistics show that the Timbers had several huge advantages in possession time (69 percent) to total shots (26 for PDX to 13 for VAN), and other impressive numbers. However, the Timbers seemed to be hesitant to shoot when the situation presented itself or deferred to other players in a string of passes. Marrufo also allowed several early challenges to the Timbers without calling fouls, rewarding Vancouver for their early and constant pressure; honestly, I thought that the Timbers really didn't react quickly enough to this cascading pressure from the visitors. When Portland found themselves down at the half, they did bring on their main source of speed in Polo and some creativity when Flores replaced Guzman, but Vancouver countered that by playing 2 lines of 5 players in defense to effectively bunker backwards. 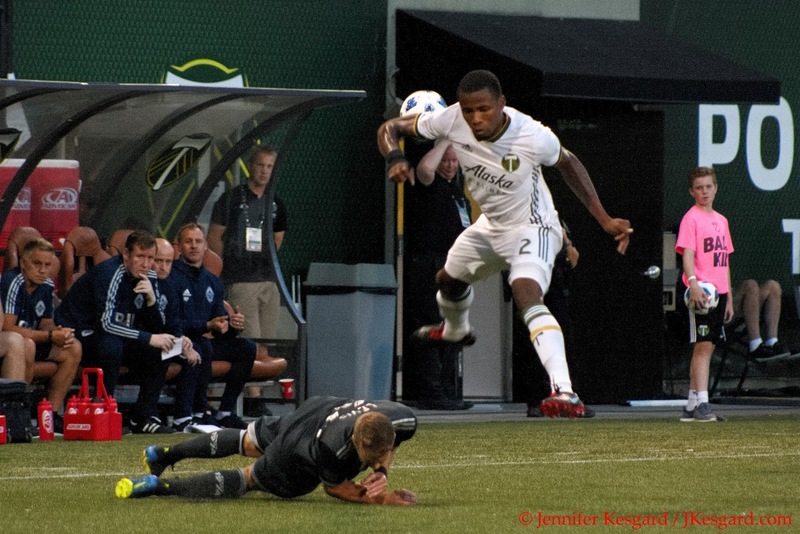 Yes, the Timbers did earn a penalty to make it close and interesting, but the team finally found a sequence of events that they couldn't overcome and Savarese couldn't find the magic combination to outmaneuver. Granted, there were recent time frames in matches with Houston, Montreal and Philadelphia where the Timbers lacked cohesion in their approach, but they managed to rally and secure the points, but in this instance, they just couldn't find the elixir. 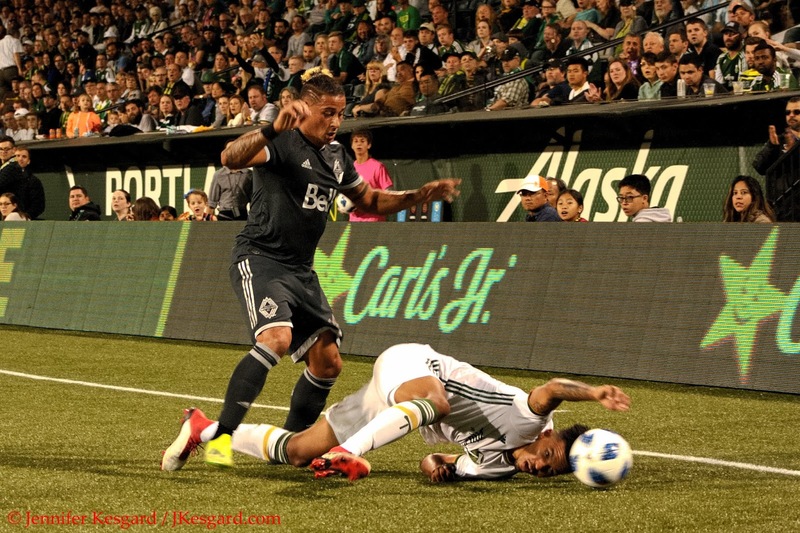 In so much as the Timbers struggled, however, the Whitecaps also put forth an gutsy effort and stayed within their plan, and they executed it to perfection. It's weird to think that a team on a 15 match unbeaten streak has questions to answer, but in many cases, the streak has really papered over some of the holes in the Timbers. Outside of Armenteros, who on the current roster can be a true target forward and create chances when needed, especially since after a good streak of play, Samuel has been bottled up in consecutive matches. The defensive line has been very good for weeks, but for most of this match, the defenders appeared slow to react and indecisive in key moments and the Whitecaps took advantage. Even Valeri, who has arguably been the most consistent offensive threat over the weeks, had a very uncharacteristically off night with several rushed shots and a missed penalty trying to be sneaky. Whether it's the pressure of keeping the streak going, playing at home in front of another sellout crowd, dealing with a rival that wanted to make an impression, or just the odds catching up with them, the Timbers collectively had enough hiccups that they just couldn't outscore. They don't have much time to find answers with a match in three days, but knowing Savarese and his coaches, the tactics and gamesmanship is already underway to deal with D.C. United and start a new unbeaten streak.